The Ariane 5 for Arianespace’s ninth flight in 2017 is being readied for a September 5 liftoff from the Spaceport, while its two satellite passengers — Intelsat’s Intelsat 37e and BSAT-4a for SSL on behalf of Japan’s Broadcasting Satellite System Corporation (B-SAT) — continue their final checkout at the French Guiana facility. The Ariane 5 for Flight VA239 rides atop a mobile launch table during its transfer from the Spaceport’s Launcher Integration Building to the Final Assembly Building. Photo is courtesy of Arianespace. Built by Boeing using a 702MP spacecraft platform, Intelsat 37e is the next satellite in Intelsat’s high-throughput EpicNG series for launch. This will also be the fourth EpicNG spacecraft orbited by Arianespace to date (following Ariane 5 missions with Intelsat 29e and Intelsat 33e in January and August 2016, respectively, plus last February’s heavy-lift flight that lofted SKY Brasil-1/Intelsat 32e). 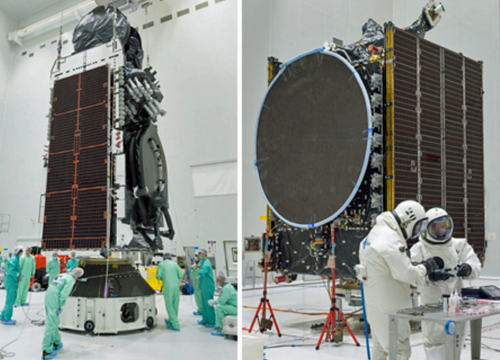 Preparations for Flight VA239’s two satellite passengers included the fit-check of Intelsat 37e with its payload adapter (left) and fueling of BSAT-4a (right). Operating in the C-, Ku- and Ka-bands, the spacecraft will provide capacity for wireless backhaul, enterprise VSAT and mobility networks. Intelsat 37e, which is to carry out its mission from a 342 degrees East orbital slot, will weigh approximately 6,440 kg. at liftoff. Arianespace is launching Flight VA239’s co-passenger, BSAT-4a, as part of a turnkey contract between B-SAT and U.S.-based satellite manufacturer SSL. To be operated from an orbital position of 110 degrees East, this spacecraft will be used for DTH TV relay in Japan and to expand the availability of advanced television services — such as 4K/8K Ultra-High Definition TV (UHDTV). BSAT-4a is based on the SSL 1300 satellite platform and is fitted with 24 Ku-band transponders and will weigh approximately 3,520 kg. at liftoff, with a design life to exceed 15 years. Arianespace has a 30-year-plus track record serving operators in the Japanese market, including B-SAT, for which it is the launch services provider of choice.